During our trips we've used a couple of different tents. We just seem to have something with them. Everytime we are going to an outdoor store, we're looking for something that might suits our needs even more. On this page you'll read some of our findings, maybe it can help you in deciding what tent to bring. But keep in mind, demands differ for every person. 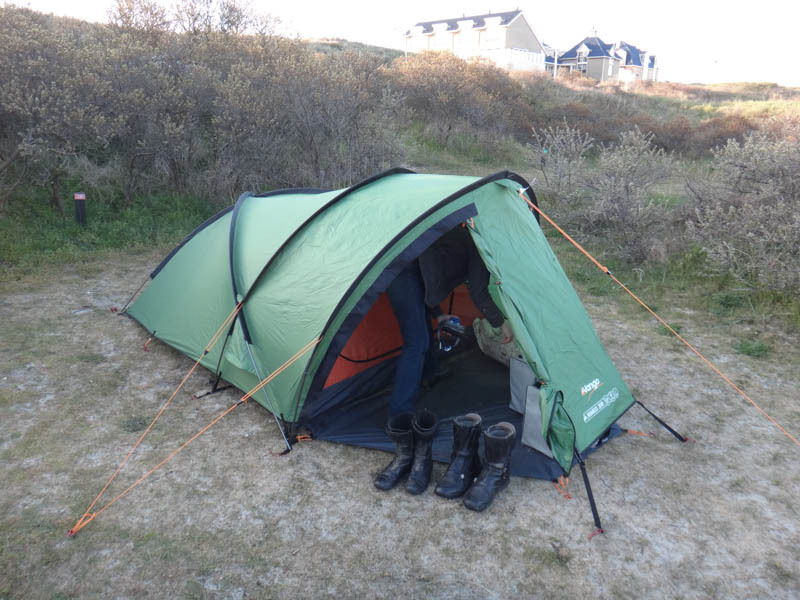 In the past we have been using a Bardani Marinello tent for our European holidays and we did so quite satisfactory. It was a very simple dome tent with a large vestibule. Easy to pitch. With the inner tent being suspended in the aluminium DAC poles it als worked without the fly. The 4 person inner tent, was offering plenty of space for two bikers and their equipment. Packing size was modest and weight (just over 5 kilos) acceptable for motorbike holidays. After years of service the tent was starting to show signs of wear. So it was time for a good replacement. Unfortunately for some reasons they don't seem to make tents like this anymore. And it turned out it is hard to find a replacement that meets our demanding requirements. We replaced the Bardani with a MSR Holler. A tent we won in an eBay auction. The inner tent of this geodesic tent is even bigger than the old Bardani. The maximum height however is a little bit less but due to its special shape it offers more space than the Bardani. Also the weight is less, its 2 kilo lighter and the packing size is smaller. Like the Bardani the tent is free standing, which is an advantage on rocky surfaces. After using the MSR Holler a couple of times, we discovered how easy it is to pitch. Even with one person it's totally doable. While one person was pitching the tent the other was already inflating the sleeping mats for which it offers plenty of space. However we also noticed it has some serious drawbacks (for us). First of all the entrance is less accessible compared to the Bardani. The fly entrance is sloping too much, which makes it hard to fully close the zippers without touching the fly. With morning dew, resulting in a refreshing wakeup and wet clothes. Second of all the vestibules are too small to be of any value. They offer zero protection during bad weather and are of no use for storing any motorbiking gear except for maybe boots. At one day we bumped into the Vaude Monolith SE, it got us reconsidering our setup. The tent has almost the same weight and packsize as the MSR Holler. However it offers about twice the footprint. Half of it being inner tent, the rest being vestibule. As there is no floorprotector available we made our own using the footprint of the Big Agnes Flying Diamond 8 person tent, just to give you an idea about its size. We used this tent for almost our entire Africa trip. But as it isn't a freestanding tent, we were already having second thoughts in Morocco with its rocky surface. It also requires two people to pitch it, which took us in the end almost 20 minutes. So when Sander's parents we're visiting us in Botswana. We asked them to take the MSR Holler with them. After a couple of safari nights in the Holler we decided to continue our journey with the Monolith. Unfortunately in Namibia the zippers started to fail. So we had them replaced with some heavy duty ones, compromising the waterproofing. Which is not really an issue in Africa provided that you avoid rainy seasons. However back in the Netherlands we ran into the Vaude Mark XT. This tent met all our requirements. It is a freestanding tent, it has aluminium DAC poles, is easy to pitch (even alone) and it is huge. Even bigger than the Monolith. This tent should have been the companion during the rest of our trip. But it just let us down in the most terrible way, ruining a big part of the fun. Just as on the picture we should have used it only indoors because after just one month the tent started leaking. Due to a design fault, according to us. The inner tent is suspended to the aluminium DAC poles by loops which are sewn through the fly. Once the fabric of the loops gets saturated with water it starts dripping inside. According to the manufacturer, it is a problem which occasionally can occur and can be solved by applying SeamGrip to the loops. Unfortunately we were in Turkey at that moment. And over there they don't have SeamGrip due to strict import rules for chemicals. But it wasn't the only problem also the doors started leaking and worst of all the waterproof zippers started to break down. After our bad experiences with pretty expensive tents. We decided not to buy expensive anymore, as they will break down anyway. So when we ran into the Vango Nimbus 300 being on sale at Soellaart (the outdoor shop from Haarlem), we decided to give it a try. The tent nowadays being sold as the Mirage 300 Plus met most of our requirements. The innertent has enough room for our Exped matresses and there's still some room for equipment. It's a semi-geodesic design, so it can more or less stand on it's own. And the vestibule is large enough to sit in, even on our Helinox chairs. There are some compromises though. It isn't possible to erect the inner tent without the fly. However we never have used or wished for that option anyway. The inner tent is suspended from the fly using a number of elastic bands and hoops. Making it possible to remove the inner tent from the fly on rainy days. Which actually can be considered as a benefit. Also the tent is made of polyester instead of nylon. To get the same strength the polyester should be thicker and heavier. But the tent weighing around 4 kilos, suggests it is less sturdy as it's nylon counterparts. However we don't think that it is going to be a problem. As we have not experienced any ripping of with any of our previous tents (including the polyester ones). In fact polyester has some advantages over nylon. It's more resistant to UV light. And it doesn't stretch and shrink as nylon does in wet and hot conditions. For us the major drawback of the tent is the lack of proper zip tags on the inner tent. For some reason Vango decided to use a knotted piece of rope. Making it impossible to lock the inner tent with a padlock. As the knots in the rope can be easily undone. We are aware that the fabric of a tent doens't offer very much protection against real thiefs. But being able to lock the zippers raises the bar for petty theft. So to resolve this issue we have added some zip tags ourselves. Right now we have tested the tent twice and we like it pretty much. Both on Texel and during the ascension weekend we experienced quite some rain and wind. The tent was very stable and kept us dry. Although at one spot a drop of water was coming through one of the seems. Underneath the ventilation window on the back of the tent. A very wierd spot as you would consider that spot at least to remain dry. Probably it was water that accumilated somewhere between the stiching of the ventilation window, searching for a way out. As a precaution we decided to use Granger's Fabsil Gold a waterproofing agent. We still have to see if that resolved the little problem, but the reviews on the product are very promissing. So with confidence we are looking forward to use our new tent.